Cover page of April 27, 2004, U. S. General Accounting Office (GAO) report for Cong. Christopher Shays, Chairman, Subcommittee on National Security, Emerging Threats and International Relations in the Committee on Government Reform in the U. S. House of Representatives, Washington, D. C.
April 27, 2004 Washington, D. C. – A General Accounting Office (GAO) report was released today about the Department of Energy (DOE)’s slow response since 9/11 to change its plans for dealing with terrorist threats at American sites containing nuclear weapons and/or nuclear materials such as plutonium. In fact, it’s now estimated that it will take until 2008 for DOE to implement its updated plan to deal with terrorist threats. Today I talked with Robin Nazzaro, Director, Natural Resources and Environment Team, U. S. General Accounting Office (GAO), Washington, D. C., about the discrepancy in terrorist size estimates given by intelligence agencies versus what the Department of Energy is prepared for, including aerial attacks. Robin Nazzaro, Director, Natural Resources and Environment Team, U. S. General Accounting Office (GAO), Washington, D. C.: “The DOE acknowledged that the risk for an unspecified air attack, but it did not lay out any protective measures to mitigate the risk. Rather, they are relying on other federal government agencies such as the Dept. of Homeland Security and Dept. of Defense to defeat such a threat. HOW WOULD DOE GUARANTEE THAT THEIR NUCLEAR WEAPONS OR NUCLEAR STORAGE AREAS WOULD BE DEFENDED BY HOMELAND SECURITY OR THE DEFENSE DEPARTMENT? Well, the DOE sites are expected to consider measures about how they handle and store the nuclear materials and to mitigate the consequences of air attack on the existing facilities. In fact, the new DOE facilities designs now are expected to include features that would mitigate any consequences of such an attack. CAN YOU DESCRIBE WHAT THOSE MEASURES WOULD BE? (long pause) Yes, I have a technical expert here who is also questioning me on any security issues. He said that the types of things that DOE would include as mitigating factors would be blast proof safes, reinforced roofing that would also be able to withstand an aircraft attack. BUT DOE WOULD BE DEPENDING UPON HOMELAND SECURITY AND THE DEPARTMENT OF DEFENSE FOR ACTUAL INTERFERENCE? Yes, as they protect the rest of the country against those kind of attacks. WHICH IS WHY WE ARE TALKING ­ EVERYBODY, INCLUDING CONG. SHAY, WONDERS IF WE ARE ADEQUATELY PREPARED? That was certainly the line of questioning today that Chairman Shay held and was the basis of the report to review these materials and to assess whether DOE is adequately protecting the materials they have in their possession. I would say, bottom line, that DOE has put this new Design Basis Threat in place. They now have to implement it. They have set a deadline at the end of fiscal year 2006 for full implementation. 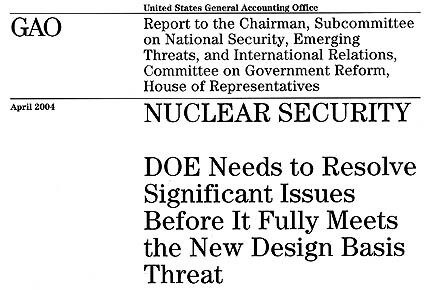 We feel DOE is unlikely to meet its own deadline. Some estimated that it could take as long as five years, given adequate funding. The five years would be from the DBT was issued in May 2003. Potential Size of Terrorists Threats Against DOE Facilities? ON PAGE 20 OF YOUR REPORT, IT SAYS, ‘IN CONTRAST TO THE POSTULATED THREAT, DOE IS PREPARING TO DEFEND AGAINST A SIGNIFICANTLY SMALLER GROUP OF TERRORISTS ATTACKING MOST OF ITS FACILITIES.’ WHY? DOE is taking into consideration what it is that they are trying to secure. So, for sites that have nuclear weapons, they are defending against a certain threat level. For other sites that would have Category 1 special nuclear material (such as plutonium and enriched uranium), they would be prepared to defend against a smaller number of terrorists. So, they are looking at what they are trying to defend against and then using the Postulated Threat Assessment ­ it is an assessment from the intelligence community ­ they are looking at this as one piece of input. They are also looking at what their facilities are like and what DOE thinks would take to defend them. DOES IT MAKE SENSE TO YOU THAT DOE SHOULD INDEPENDENTLY PREPARE FOR A SMALLER THREAT FROM TERRORISTS THAN OUR INTELLIGENCE COMMUNITY THINKS IT SHOULD? The intelligence community was setting threat levels that were worldwide. So, they were based not only on the kinds of threats that we could experience within the continental U. S., abut also in foreign countries. So they provide a range of what it would take to defend these sites. So, they said DOE took that into advisement and then made their own assessment. SO GAO IS CONCERNED ABOUT POTENTIAL BIOLOGICAL, CHEMICAL, AND NUCLEAR SABOTAGE IN DOE FACILITIES. Yes. We applaud DOE for adding additional requirements to the DBT such as protecting strategies to protect against radiological, chemical and biological sabotage. However, we believe DOE needs to re-evaluate its criteria for terrorist attacks of that type, especially in the chemical area to make it more defensible from a physical security perspective. WHAT WAS DOE’S ATTITUDE AT CONG. SHAYS’ SUBCOMMITTEE HEARING? As of today, DOE does not resist the GAO recommendations. They have concurred with out recommendations and our taking immediate actions. Our reports are often done at the request of someone in Congress, so we make recommendations. There is a requirement that the agency discussed follow up and notify the Congress as to their actions as they respond to our recommendations. We also follow them up. WHAT IS DOE GOING TO DO? They are going to be studying the development of the Design Basis Threat so in the future they can move more quickly. They are also going to look at the threat assessment where we have criticized therm for assuming a smaller group of protected force to protect against. AND CONGRESS HAS CONTROL OF THE PURSE STRINGS OVER AGENCIES IF THEY DON’T COMPLY? Previous PostPrevious Update About Microbiologist Dan Burisch, Ph.D.